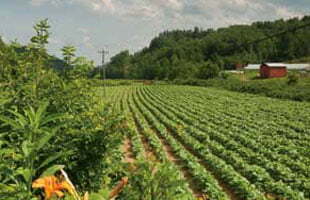 Highlands Family Farm sits on 125-acres of beautiful farmland in Burke County, North Carolina. Farmer Daniel Wall and his business partner Jon Mercer come from decidedly different backgrounds, but together with their young families they’ve started a farm that promotes their shared commitment to sustainable agriculture. The friends got to know each other at church, and decided to become business partners after discovering their shared appreciation for books by sustainable agriculture pioneers, including Joel Salatin, Greg Judy, and others. “It just seemed like a natural progression to focus more on sustainable agriculture and give us a chance to get away from just cattle to multi-species grazing.” Daniel says. Over the past five years, Daniel and Jon have added hogs, turkeys, chickens, and lamb to the farm in an effort to diversify their business model and make the best use of the land. Unlike some farms that raise animals indoors or rely solely on grain or hay, the animals at Highlands Family Farm are primarily grass-fed and live their entire lives on the farm’s pastures. The only exception is the poultry, which need a dry, heated environment until they grow feathers and are big enough to live outside. None of the animals are treated with growth hormones, and all are given room to roam. Daniel says one of the biggest challenges to raising animals this way is keeping them safe from predators. The farm’s 120-pound Maremma sheepdogs guard the livestock, and this approach has allowed the farm to expand into animals that need more protection, like lamb, which Daniel says is their most rapidly growing enterprise. Beyond building a thriving business, Daniel and Jon want to help connect the community with the source of their food. 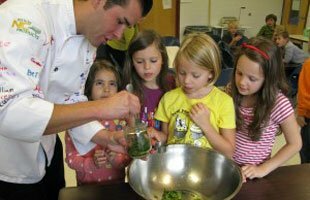 In addition to farming, Daniel is also the principal at Icard Elementary, which participates in ASAP’s farm to school program. One of the school’s early projects was raising chickens. “The kids would go out and take care of the chickens and collect the eggs, just like I did as a kid,” he says. Jon says that every day on the farm is a new learning experience for him, and passing down this knowledge to his kids is part of the reason he farms with Daniel. Working together has brought their two families closer together. Find more information about Highlands Family Farm at www.highlandsfamilyfarm.com and in ASAP’s Local Food Guide.